SUBHEAD: Should we carpet-bomb the Galapagos Islands to defend the U.S. from North Korea? How about the Mariana Islands? Image above: A beach on Pagan island, which would be used for amphibious-attack training and numerous detonations. As preposterous as it sounds, this is precisely the same logic the Pentagon is using to propose “full-spectrum” military exercises in and around the spectacular Mariana Islands. The Marianas may be less well known than the famed Galapagos, but they are equally pristine and biodiverse. “Full-spectrum” live-fire military exercises means year-round amphibious attacks, bombing, torpedos, underwater mines and other detonations from the air, from the sea, and from the ground, as well as sonar training that will result in permanent hearing loss for up to 59 whales and dolphins per year. Because the Mariana Islands, located in the western Pacific, are nowhere near as renowned as the Galapagos, the U.S. military has been able to get away for the past three-and-a-half years with conducting full-spectrum live-fire training on the island of Farallon de Medinilla, as well as over a half-million square miles of the open Pacific, wreaking death and suffering to all marine life. They've renamed this bioregion in their own war jargon: the “Mariana Islands Range Complex” (MIRC). [IB Publisher's note: Sounds like "Pacific Missile Range Facility" (PMRF) right here on Kauai.]. Since the imposition of the MIRC in 2010, Farallon de Medinilla, once teeming with amazing sea life and rare migratory birds, has been bombed and disfigured to unrecognizeability. 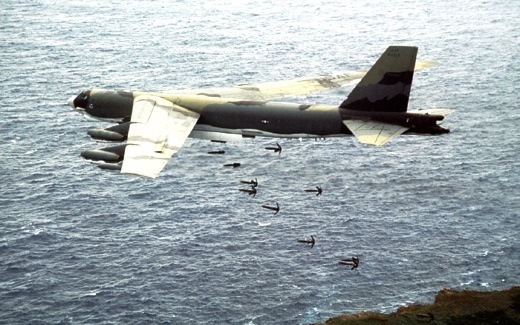 Image above: B-52 StratoFortress dropping Mark-82 227kg high-drag bombs over Farallon de Medinilla Island in the Marianas. As if that isn’t enough of an atrocity, now the Pentagon is proposing to expand the environmental holocaust to one million square miles over an area of open Pacific ocean larger than the states of Washington, Oregon, California, Idaho, Nevada, Arizona, Montana and New Mexico, combined. This expansion they’ve also renamed: the “Mariana Island Training and Testing” (MITT). 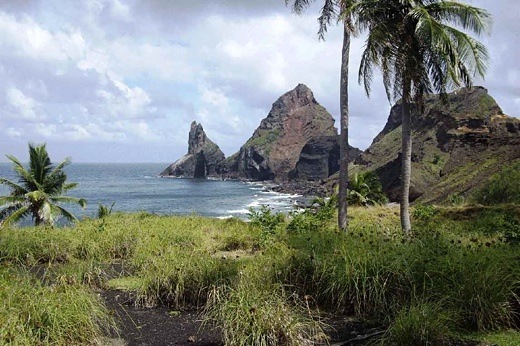 The MITT proposes that exquisitely wild Pagan Island, where countless endangered species now thrive, would go the way of Farallon de Medinilla. ACT NOW! PENTAGON ACCEPTING COMMENTS ONLY UNTIL DECEMBER 11! From now until Wednesday, December 11th 2013 the Pentagon is taking comments from the public on its MITT. PLEASE TAKE A MOMENT TO COMMENT, especially as how the MITT would violate the National Environmental Policy Act and other environmental laws passed by Congress. A comments form, as well as all documents related to the MITT, can be found at (http://mitt-eis.com/GetInvolved/HowCanICommentonthisEISOEIS/SubmitAComment.aspx).